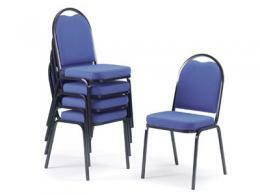 What is the purpose of the stacked chairs trolley? 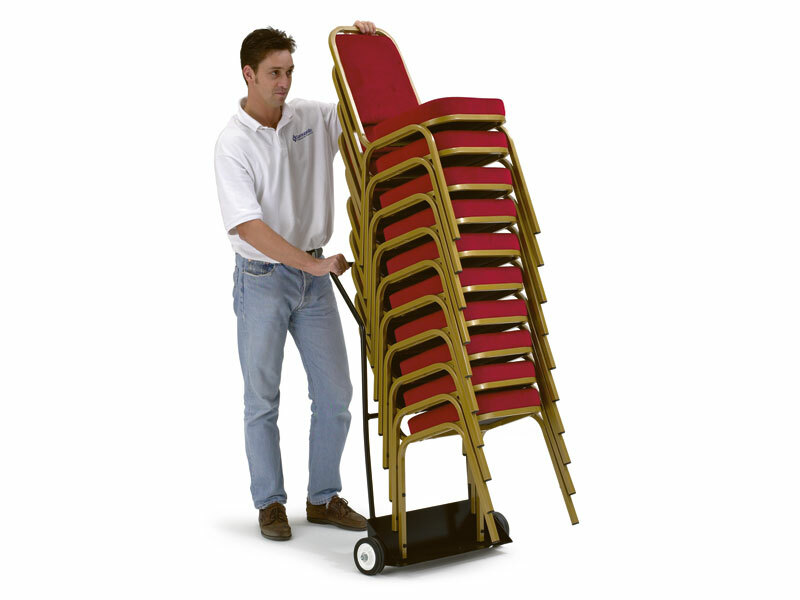 This trolley allows for the easy transport of stacking chairs intended for large events. Minimize the risk of injury to support staff and allow event set-up to be handled more quickly and with shorter notice. The easier it is to place chairs into storage and bring them back out again, the more likely it is that support staff will be able to keep the major event rooms of your office facility clear and open. This trolley is especially well suited for our Kempton, Ripon, Hinton & Pembroke ranges of chairs although it might also be suited for other stackable chairs as well. Steel construction is light-weight yet durable. The rubberized wheels roll freely with minimal resistance, making meeting set-up as easy as possible. 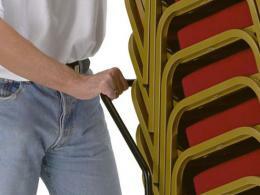 Chairs stack onto the trolley by the back wheel only and are leaned back and thereby rolled away easily. 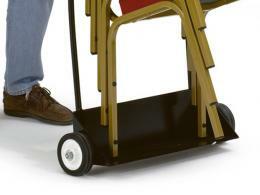 Setting the trolley and chairs down prevents unanticipated movement when the chairs are unattended because they front legs sit directly on the floor and prevent the trolley from rolling. This stackable chair trolley is essential in any facility that serves the public and conducts frequent large meetings that use stackable chairs. The stackable chair trolley is a great assistance for the support staff in your facility, minimizing chances of injury and making meeting set-up and take-down as quick, convenient and effortless as possible. This trolley is backed by a standard 1 year parts & labour warranty. If there should be any performance or appearance problems caused by manufacturer’s defect, the warranty will cover replacement or repair. Delivery times for the product range from 5 to 15 days within Britain. The Workplace Depot offers its Price Promise – we will beat any competing price on the same item. We also feature a liberal returns/exchange policy within 14 days of purchase.